Designers can place 3D versions of all electrical parts into their model, and run wires/cables/harnesses in 3D to connect all electrical equipment. This enables you to plan specific locations and paths, and accurately determine wires/cables/harness lengths before equipment is built to ensure consistent manufacturing and to reduce scrap and costs. Your 2D schematics and 3D models are synchronized bi-directionally in real time, so any changes are automatically updated. Create schematic-driven harness designs in the 3D model, utilizing real-time bidirectional functionality coupled with powerful routing, flattening, and automatic documentation capabilities. Advanced SOLIDWORKS routing technology with advanced diagnostics provides highly simplified autorouting of wires, cables, and harnesses from within a 3D CAD model. The routing detail information is available instantly to all project users. Project design data is synchronized in real time, bidirectionally between schematics and the 3D model. This allows key information, such as BOM and design data, to be unified between design disciplines and users. SOLIDWORKS Electrical enables multiple users to work on the same project simultaneously. SOLIDWORKS Electrical combines SOLIDWORKS CAD and Electrical technologies, to provide a cohesive environment for electrical 3D cabinet design that is synchronized in real time without the use of external files and can utilize existing CAD data. 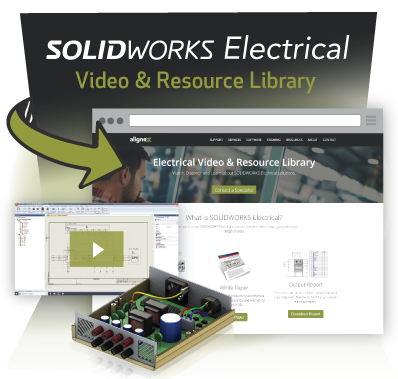 Using industry-proven SOLIDWORKS automation tools, SOLIDWORKS Electrical provides extensive capability and usability for all aspects of electrical 3D cabinet design and documentation.